Withings on Tuesday announced the addition of automatic swim tracking to its iPhone-compatible Activite and Activite Pop smartwatches via a firmware update, with plans to further expand the feature in "coming months." Both products are water-resistant to a depth of 164 feet. 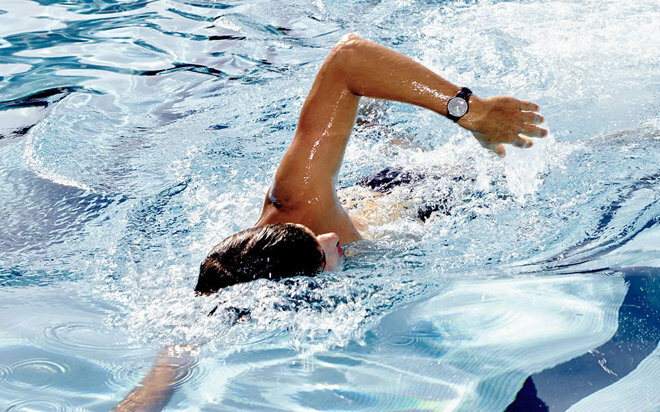 The addition means that in order to record a swim, wearers need only jump in the water and start swimming for data to be synced when the watches connect with a paired iPhone or Android device. The Activite and Activite Pop are functionally identical, but the former is made out of high-quality materials, including Swiss-made steel, sapphire glass, and a leather strap. Owners must actually switch to a bundled sports band to take the Activite swimming, whereas the Pop is ready out-of-the-box. The standard Activite costs $450, while the Pop is $149.95. Swimming support is a relatively rare feature on fitness trackers. Even flagship trackers from Fitbit and Jawbone don't have the technology, and Apple generally advises against getting the Apple Watch wet beyond sweat and rainstorms. Unofficial tests have seen the Watch survive tough underwater conditions, but there is no option for swimming in the device's Workout app.